As sewists there are two big things we collect— patterns and fabric. I mean, we just can't help it, right? Now, how often do you buy a new pattern or fabric only to put it away when you get home and forget about it? I do that all the time. 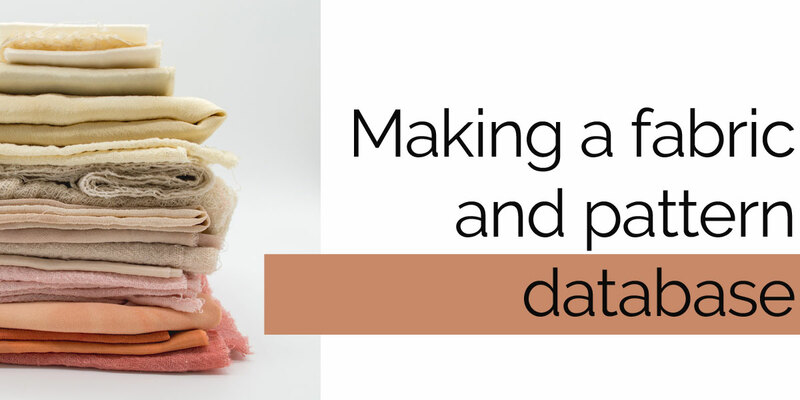 But I've discovered an easy way to put my sewing patterns and fabric collection in a database so I can easily see what I have and what I need. In 2013, Linda took her first workshop with Alabama Chanin down in Florence, Alabama. It was a weekend that would change her sewing forever as she started incorporating Alabama Chanin's signature intricate embroidery and appliqué techniques into her own garments. 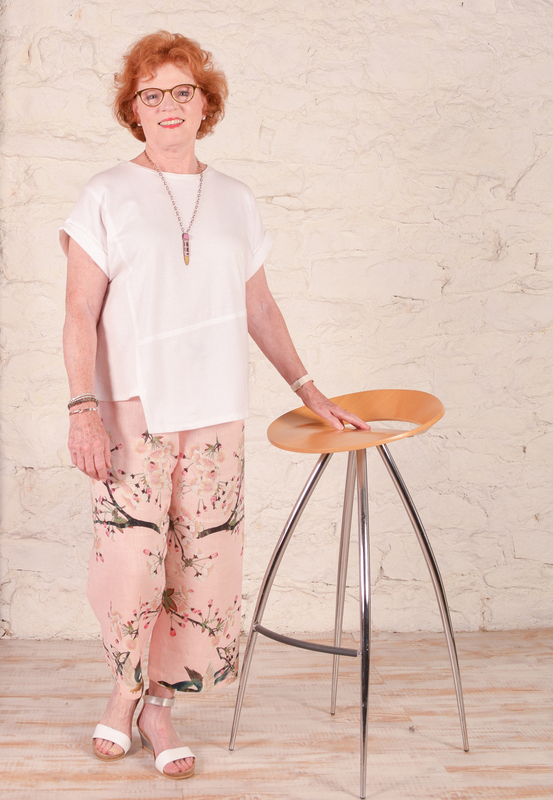 It also introduced her to the beautiful American-made, organic cotton knits manufactured and used by Natalie Chanin in her designs. Today we are one of the few places where you can buy the full range (25 colors) of Alabama Chanin knit! 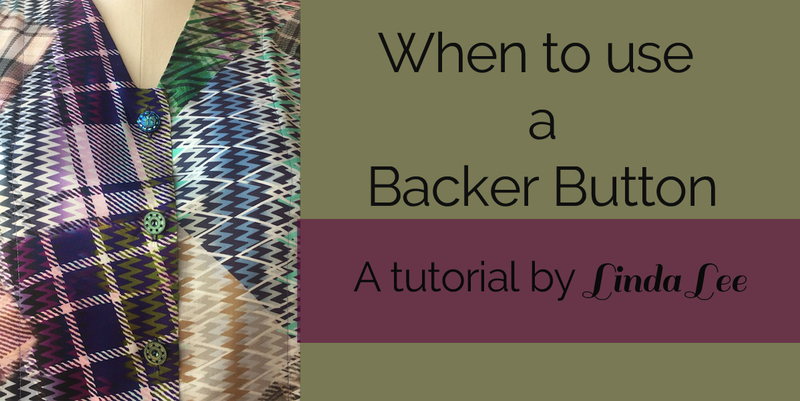 But, what if you don't want to spend all that time hand stitching, beading or appliquéing? 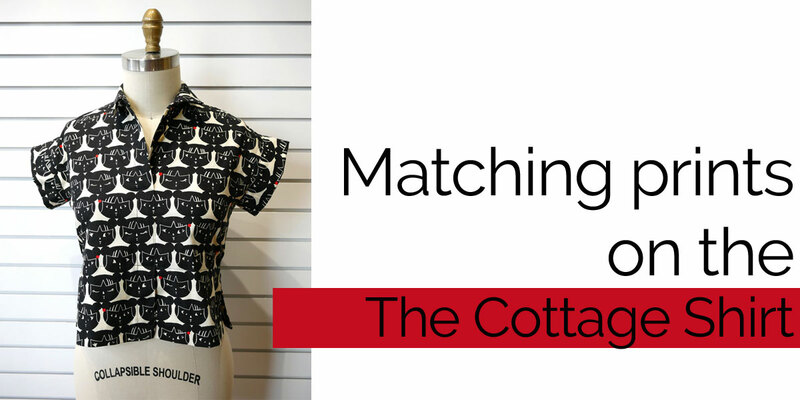 What if you just want to add a little detail to a simple garment? Well, we have three ideas for you. At our Sewing Workshop at the Sew Arkansas retreat last April we hand-dyed silk to use as linings in the Tremont or San Diego jackets. I decided to use some of my silk to create a scalloped-back MixIt Tank. I mixed the pink silk with our a stripe ponte knit. 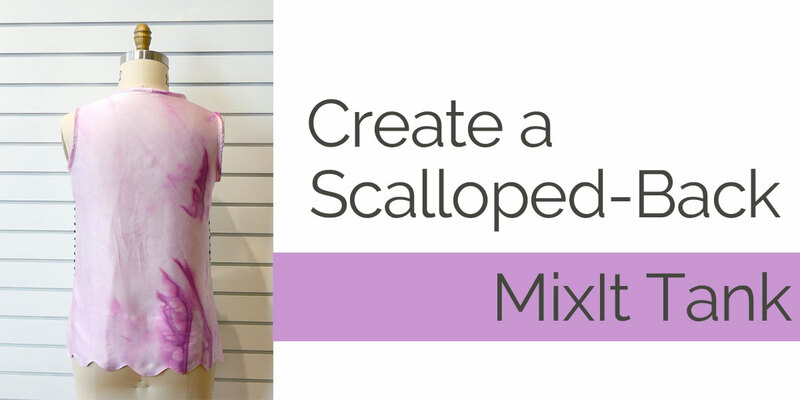 The process is simple, and I love how the addition of the scallop hem adds a little surprise to the MixIt. ​Those of you who followed along our Cottage Shirt Sew-Along may have wondered why I didn't show my finished Cottage. Well, there I was, getting ready to sew the buttonholes when I realized that the fabric design didn't match in front. And I knew that I just couldn't wear the shirt with a non-matching front. I rarely use a print that is as grid-like as this one, so mostly I don't worry about matching prints. In fact, the prints not matching on the side didn't bother me at all, but something about that center front being off was just too much for me. So I took the almost-finished Cottage apart and started again. I've always liked the look of the West End Jacket. It is a great looking, casual jacket that can be thrown over anything. However, I am not a fan of a hood, so I have avoided making it. But when I was thinking about making a garment using our fabulous Palm Tree fabric, I decided that it was time to tackle a woven, hoodless version of the West End. 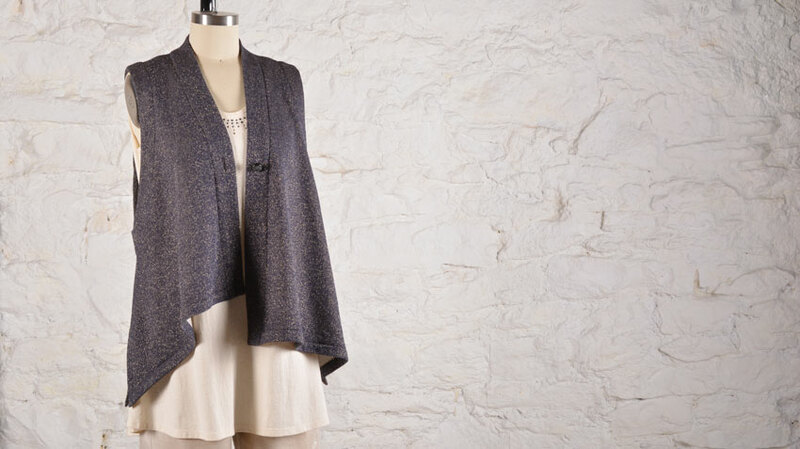 Creating the jacket without the hood was incredibly simple, involving just a few tweaks to the pattern. Read along to see how I did it and make your own! 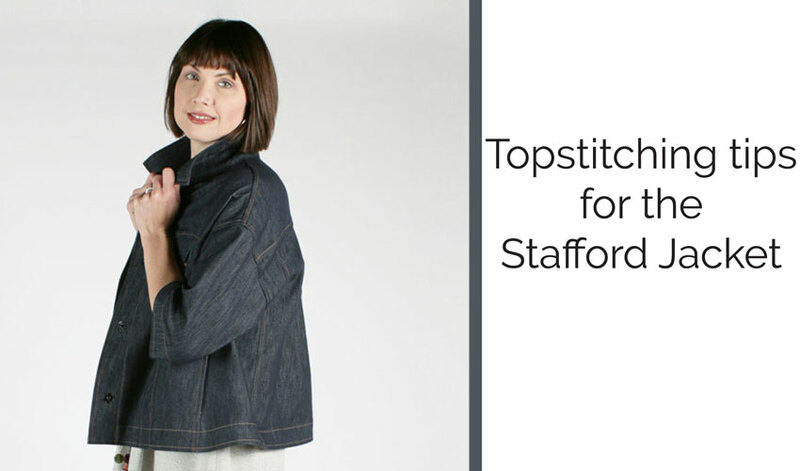 Our new Stafford Jacket was inspired by that most classic of garments, the jean jacket. Who doesn't have a jean jacket (even I have one and I don't own any actual jeans!). There is just something so right about the slouchy denim jacket. It is comfortable, functional and always looks good. Thinking about the Stafford, we combined the archetypal jean jacket with a cropped swing shape. The most unique feature of a jean jacket is the wonderful topstitching featured on the front, a detail we incorporated into the Stafford. Good topstitching is the hallmark of a professional looking garment, but can be tricky to perfect. 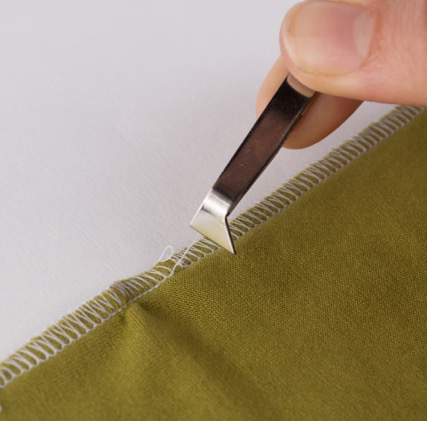 Read on for some suggestions on making your topstitching clean and professional. When you love a fabric, but it's not quite the right weight for the piece that you want to make, what do you do? This is what happened to me recently. I fell in love with this printed handkerchief linen fabric and couldn't get past the idea of making pants. But the fabric was too sheer for a bottom weight. ​I've been seeing a new trend in t-shirts popping up recently. 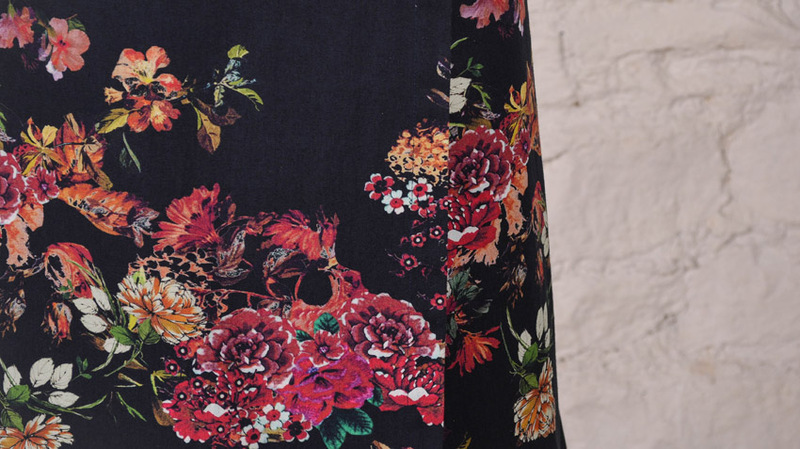 Stores like Anthropologie and Modcloth are updating the classic top by combining different prints and fabrics. 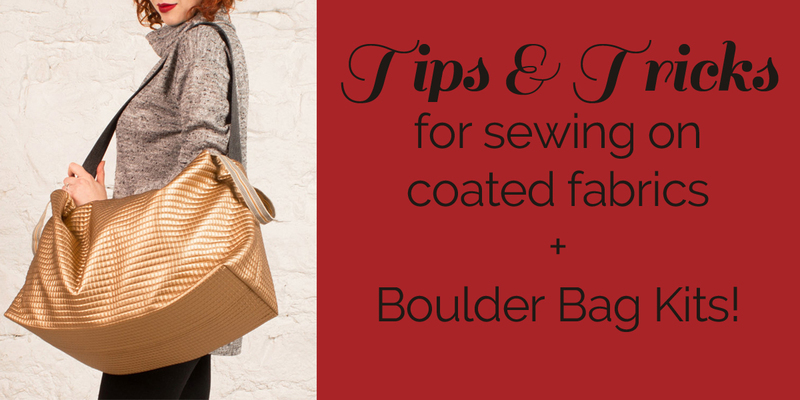 This isn't a totally new concept, but it can be tricky to sew a woven and a knit together. Luckily, Linda has us covered. She created a tutorial for this very trend last year - she is so on top of it! Check out some of the ready-made shirts I've seen in stores below, as well as the Eureka tutorial. 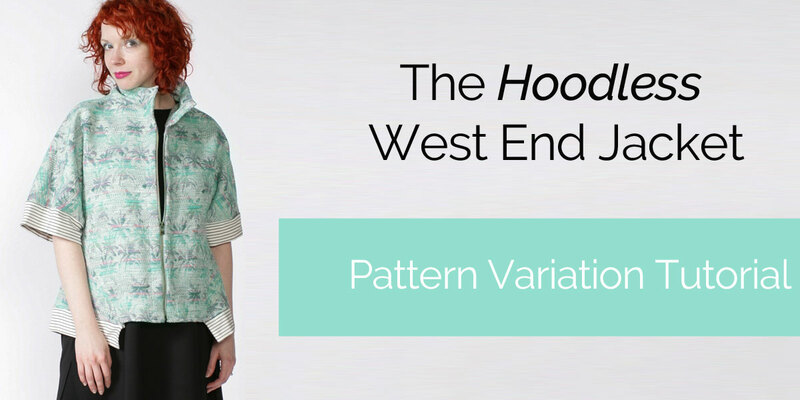 I'm re-publishing the original post so you can make your own combination top with the Eureka pattern! 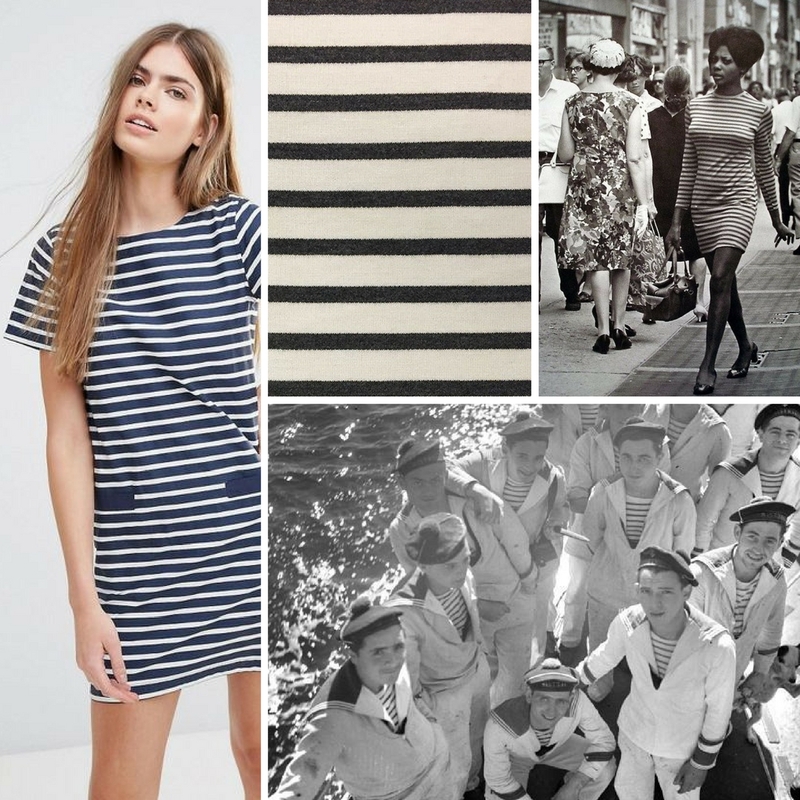 Since being introduced by Coco Chanel in her 1917 Nautical Collection, the Breton striped shirt – originally designed as a French naval uniform – has held a firm place in fashion's favor. The jaunty stripe is casual yet chic and gives its wearer a splash of insta-cool. You can find the Breton in shirts, dresses, scarfs and sweaters. 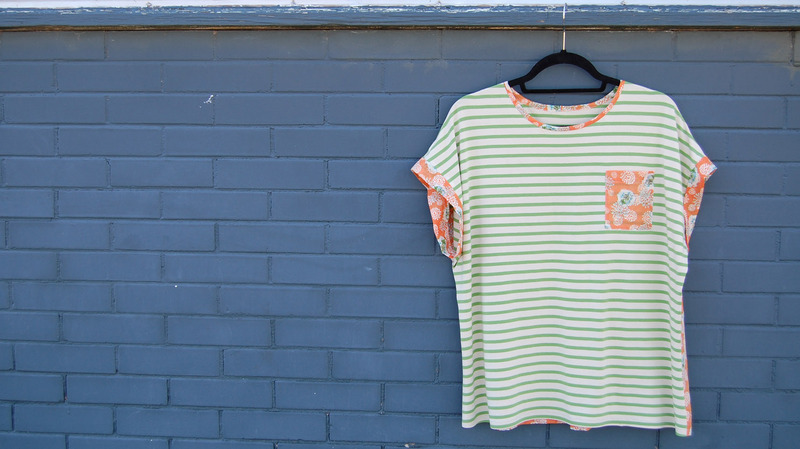 This ubiquitous stripe has found itself made into every garment under the sun, though it is most popular in a classic t-shirt. 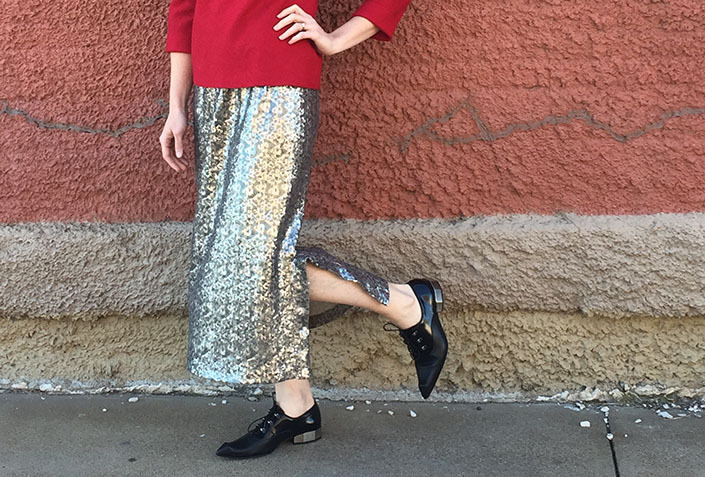 Alex took the new Memphis Dress pattern to the next level, making it her very own. 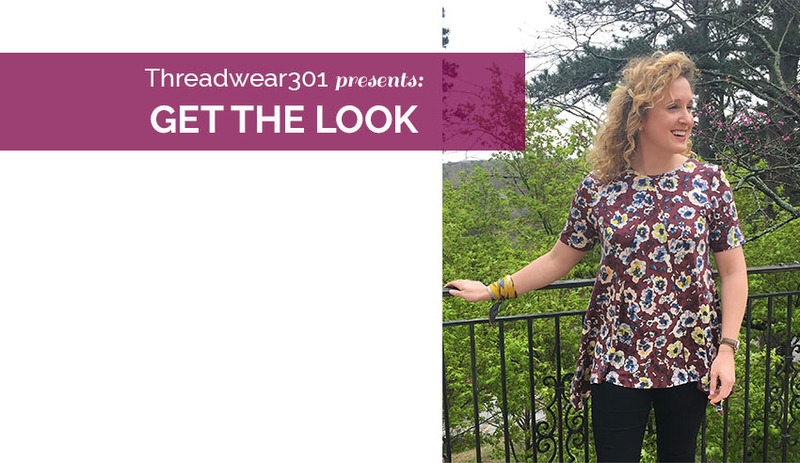 Be inspired and get this look today. 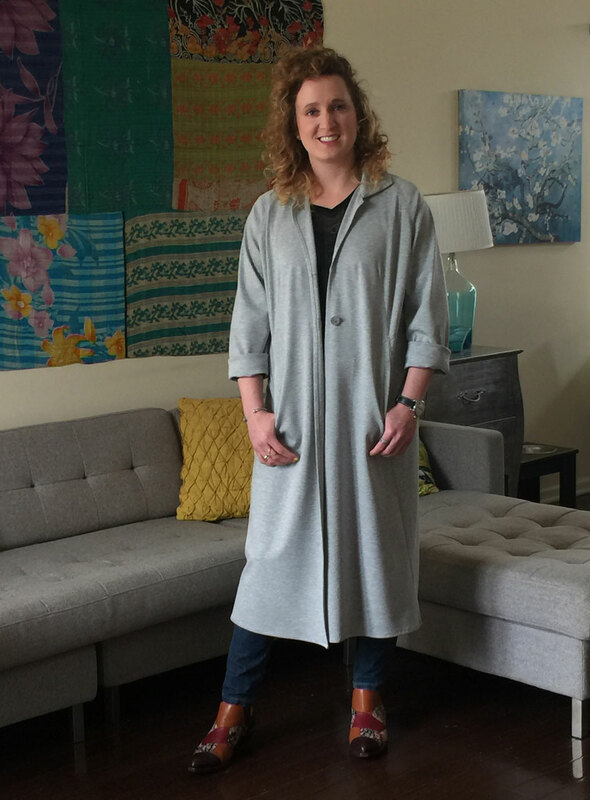 Alex spent some time in Eureka Springs, Arkansas for our Sewing Workshop retreat this past week where she whipped up a great version of the Alex Top. 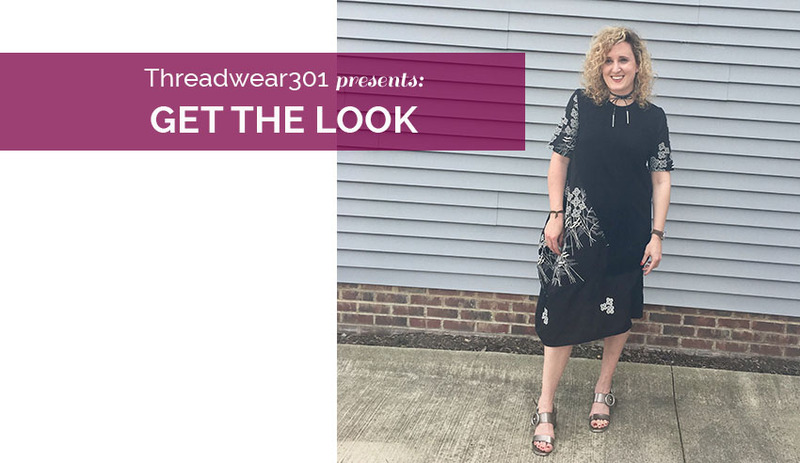 Be inspired and get this look today. The San Diego pattern has a very unique way of making the facing and collar. The process isn't difficult but requires precise stitching to get a clean, sharp look. We have made a lot of San Diego samples and have found, through trial and error, several tricks for more accurate stitching. To help you make your best San Diego, we have put together a little tutorial on sewing the neckline, complete with tips that we have found make the process easier. Enjoy! Sequins. 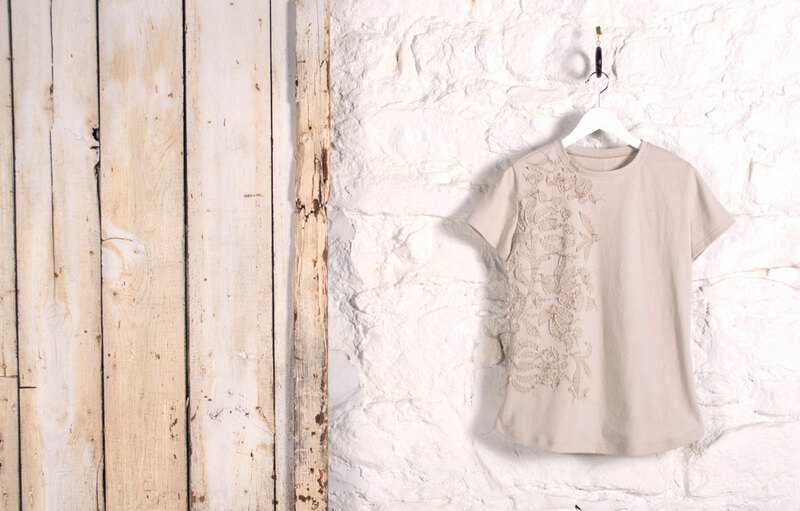 It's the perfect festive addition to your wardrobe and we've got the perfect pairing for you! Sometimes the simplest tools can be the best. Take the humble tweezer. Sure, it has been stereotyped as a bathroom-only apparatus used only for splinters and the stray eyebrow hair. But the tweezer is more than that, it is an apparatus that can be used in the most delicate of sewing situations. 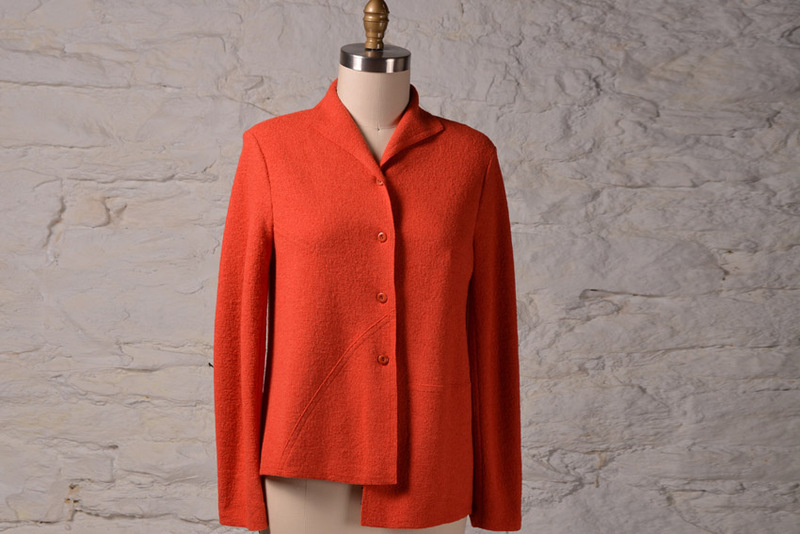 Have you seen a version of a beautiful oversized red jacket flying around the inter-webs? Well, according to Melissa Greene and friends, it's all over the place and she just had to make a version of it, and, well . . . we love it. 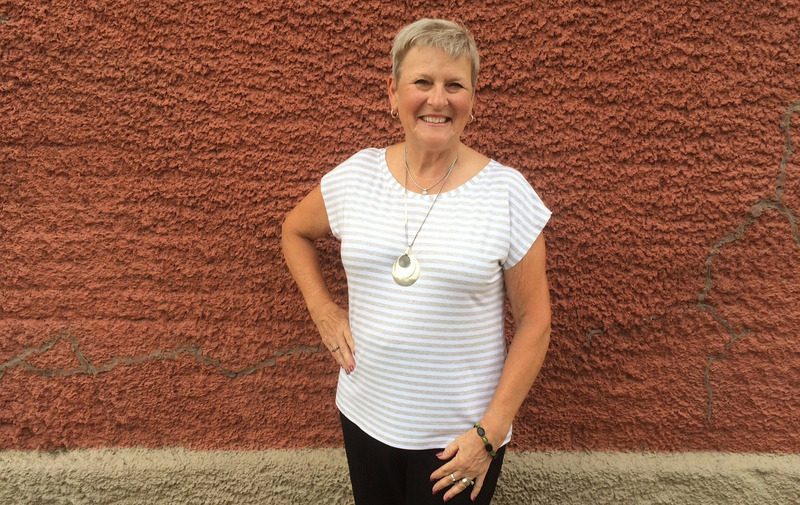 Carol Scott attended Sew Kansas this summer and wore a really cute variation of the eTee that resulted from her running out of fabric! We asked her to share her process. Here's a take on a pieced variation of the staple pattern, the Eureka Top. I love the look of long vests and sleeveless blazers. 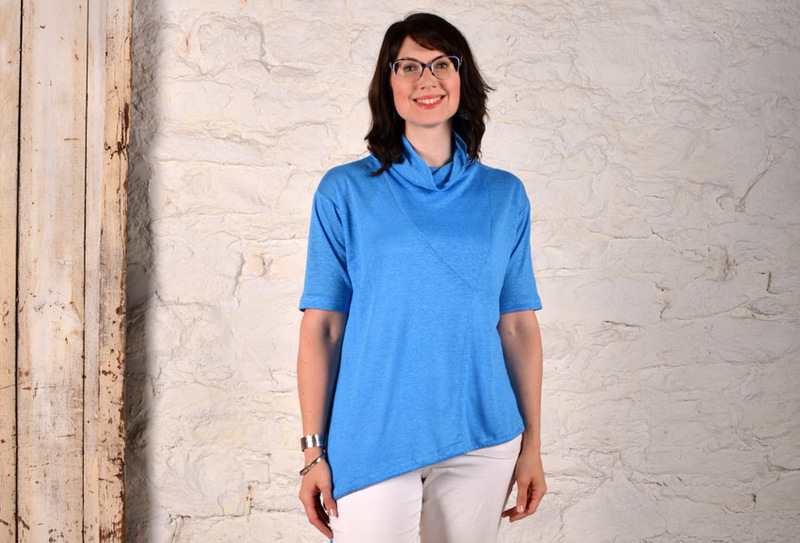 Our Mimosa Top has a lovely shape and crossover neckline that gives it that perfect structured look. In the December 16, 2015 blog post called French Terry Topper, I described the process of lengthening the Chicago Jacket to make a longer version in French terry. The coat looks and feels great, but I noticed after it was made that it wants to fly open at the bottom a bit, even when just hanging on a hanger. I love crinkled fabrics. Not only are they interesting, but they hide a lot of things that you don't want to show, including your stitches! ​Have you seen the Barcelona Top? 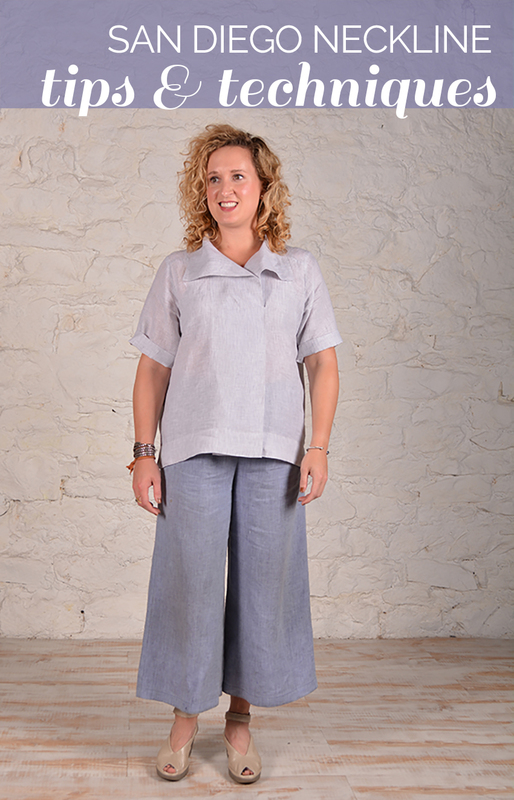 Our brand new pattern is perfect for summer with one easy modification - shorten the sleeves. See how easy it is to make your Barcelona comfortable for the heat wave! Pants silhouettes are ever-changing, but one constant in the last few seasons is that pants tend to have interesting shapes and details on the lower portion of the legs. Every time I fly to Chicago, I always make time to walk through Neiman Marcus on Michigan Avenue to see the Eskandar line of clothing.The pieces are simple. The designer basically turns out the same designs every season and simply changes up the fabrications and perhaps a length or two. I've known Ellen March, editor of Sew News magazine, for a long time. I wrote articles for her and even fielded questions in the Q&A department for years. When she called me and asked if I would be a guest on her Sew It All TV show, I couldn't resist an opportunity to work with her in another format — on camera! The inspiration for this jacket came from an OSKA advertisement. It was a yellow felled-wool jacket that had all the "bones" of our Zona Jacket. I love to create garments with boucle nylon and wool fabric using lapped seams and raw edge techniques. 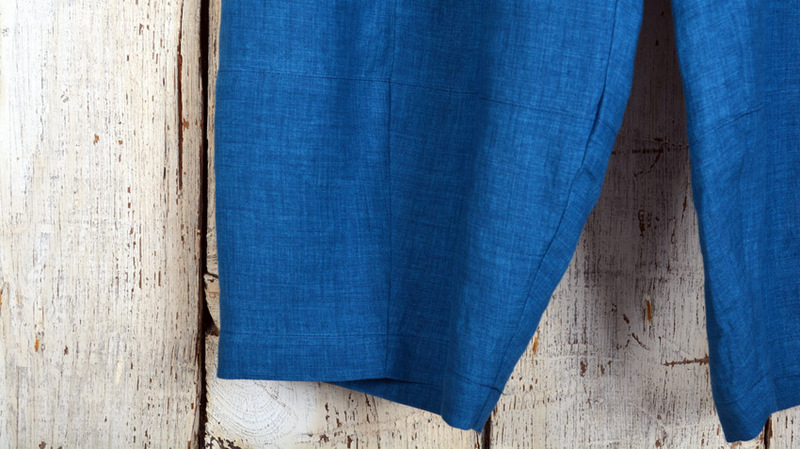 French terry is a type of jersey knit fabric that has vertical ribs on one side of the fabric and fine loops on the other side, unlike terrycloth, which has loops on both sides. It has entered the fashion scene once again and is used by designers for all kinds of ready-to-wear including coats and toppers. This Metallic Terry Knit is very unique. Soft and warm with the perfect amount of sparkle. A traditional sweatshirt or jacket just wouldn't do. The new Tremont Jacket pattern has a great fit. So why not try a vest? After my wonderful retreats at Alabama Chanin in Florence, Alabama last summer and again this summer, my obsession with AC-style stitching is unrelenting—not driven, but truly relaxing and satisfying. The tulips and irises are blooming. The toes are painted and sandals are out. It's spring! Wearing dresses is a simple way to get dressed in the morning, year round. But it's essential in the spring and summer to stay cool. In an effort to make every pattern into a tunic or dress, I tackled the Now Shirt. Sometimes simplicity is enough. Take a great fabric, add some cool webbing, and make a straight-up conventional tote bag, just for fun. Not bad for a Saturday afternoon watching a little college basketball and enjoying some rare winter sunshine coming through my sewing room window. And the stitching goes on! Using the new eTee download pattern and the Alabama Chanin organic cotton knit in Dark Grey, Kathy created this darling t-shirt that she claims is "girly", but we love it anyway for its creativity and charm. The Sewing Workshop was lucky enough to host a great group of garment sewers in Eureka Springs in April for a fun three-day workshop. Several of the participants wanted more detailed instructions on how the pleating was done on left front of this Riveria Shirt made from Japanese cotton. 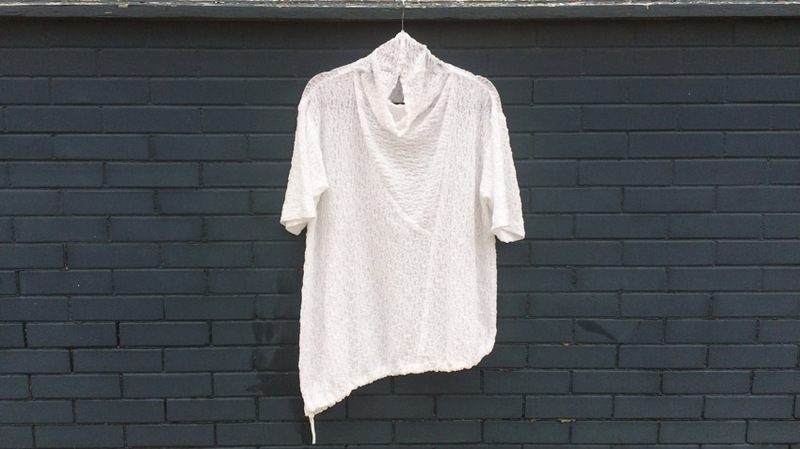 I lengthened this one 3″ and used two colors of the Alabama Chanin organic cotton jersey in white and natural. Plus I used the embroidery floss to hand stitch some parallel lines of diagonal running stitch embellishment along the lower right front. Here's a little tutorial so you can create your own Ruffle Urban T-Shirt! On a recent trip to Mulberry Silks in Carlboro, NC, I saw Nancy Quaintance in yet again one of her fabulous creations. She was wearing an Icon Shirt as a vest made in a combination of leather and wool. I was so enchanted with it, that I came home and made one for myself in a Chocolate Brown Cloque. 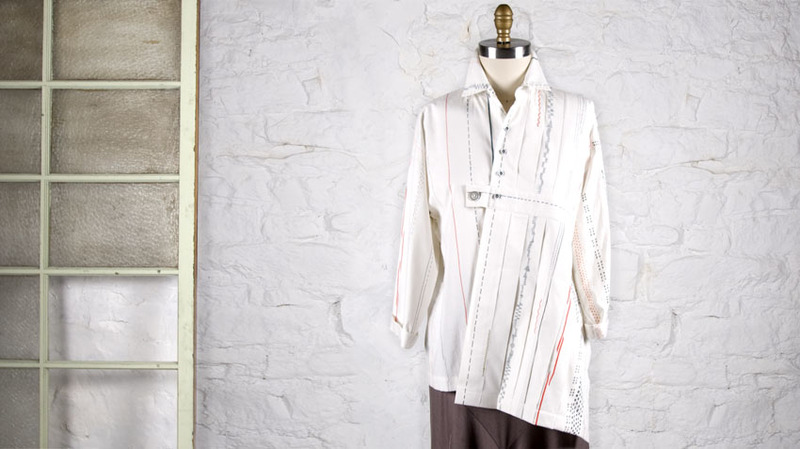 Whistle-less shirt in a handkerchief weight stripe linen that is easy to sew and wear. I don't always want a zipper closure on the Quincy Top. I can't always find the exact color and length of separating zipper - at least quickly. Also, the fabric that I used, EBL004 Linen - Frosty Pink & Green, was so soft and semi-sheer, that I thought a zipper would be too heavy. So it is possible to convert the front to a button closure with some simple adjustments. Has the eShrug become your summer staple yet? I know it has for me. It's always chilly at our office, so the shrug is so easy to throw on with a simple tank, button-down shirt or sleeveless dress. But what happens when the AC really gets out of hand? I do believe that spring is going to grace us with it's presence this weekend. Finally, I can wear floral without a wool cardigan, scarf & gloves. What a concept! I'm ready to pull out the lightweight linen, colorful florals, and vivid accessories. And when the garments in my closet don't excite me for the upcoming season, why not create something new? 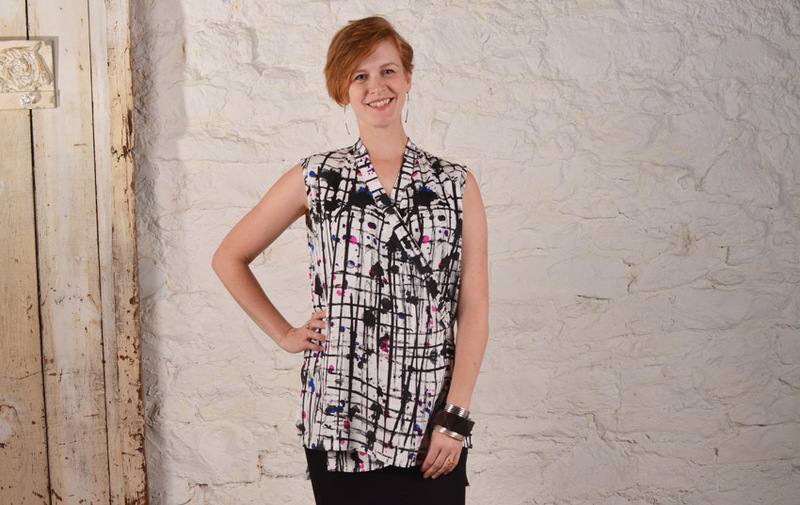 Using a pattern that never fails, Linda created a fresh new San Diego tunic. I just can't stop sewing. Those creative juices are flowing!!! Next stop, the Verona Jacket. The Verona Jacket has always been "uncharted territory" for me. It's a little more fitted than I would normally choose to wear. I like more movement & flexibility in my clothing. But this is such a great pattern, I needed to find a fabric that would make this garment work for me. Then we received the most amazing heavy-weight wool knits, in floral. I couldn't resist. I like to layer my clothing so I can adapt to seasonal changes or to temperature variations in buildings, and the one of the best garments to make for that purpose is a tank.